Lakers’ point guard Lonzo Ball has struggled considerably with his shot over the past two seasons, drawing a lot of criticism and expressions of concern from many people from both his Lakers team and all around the NBA. Both his on-court shooting problems and his unorthodox form have drawn people to say that he must change the way he shoots if he wants to have a long career. The claim is that he’s likely to continue struggling against the tougher and best defenses in the NBA if he doesn’t reinvent himself. It’s needless to say that his performances have so far proven his critics right as it seems that during his first two seasons Lonzo can’t get his shot to go down. He shot 30.5 percent from three-point range in his first season and 33 percent from beyond the arc so far in his second season. Although he’s only an NBA sophomore and is likely to improve his long-range shooting as he grows as a player, the concerns around him stem from the fact that his shooting struggles are not only limited to the long-distance type. There are three big concerns with his shooting that negatively affect his scoring. The biggest reason he has problems putting points on the board is probably his poor free-throw shooting form, which reflects badly on his fundamentals and overall form. In his rookie season Ball shot only 45.1 percent from the free-throw line and in his second season he’s somehow gotten worse as he’s now shooting 41.3 percent. This is likely a mental and mechanical problem that has gotten worse since his college days and has now become a big problem in the fourth quarter of close games as teams are intentionally fouling him as he’s likely to miss at least one of his shots. Ball and the Lakers staff must urgently work on his free-throw form to get it to at least decent levels because otherwise he will be sent to the bench or continue to stagnate their offense late in games. Also, Ball has problems finishing plays at the rim as he often gets his shot blocked when trying to finish over taller players. If he’s ever going to become a scoring threat, he needs to work on his form to learn to develop a consistent floater that he can consistently rely on when he faces elite or taller defenders. Of course, consistency has always been one of Lonzo’s big struggles as he can’t seem to put together a long streak of games with efficient shooting and that is a real drawback when a player is expected to function as the starting point guard of an NBA team, a position where the best players in the league are supposed to be steady and consistent. 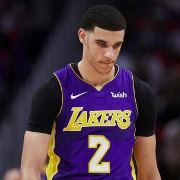 If he doesn’t change his form Lonzo is likely to continue to be among the worst shooters in the NBA, which in the long run could cost him not only his spot on the Lakers but his future as a player in the Association.